The River Ribble floodplain at Long Preston is of national importance because the flat valley bottom and river features supports unique wetland flora and fauna. Most of the upper Ribble's catchment area is based on limestone. This gives the water qualities that can support a unique range of aquatic plant species as well as dragonflies and otters. High water quality also allows a range of coarse fish species to breed here, which in turn support species such as otter. Because of its importance, the river and part of the floodplain are designated as a Site of Special Scientific Interest (SSSI). 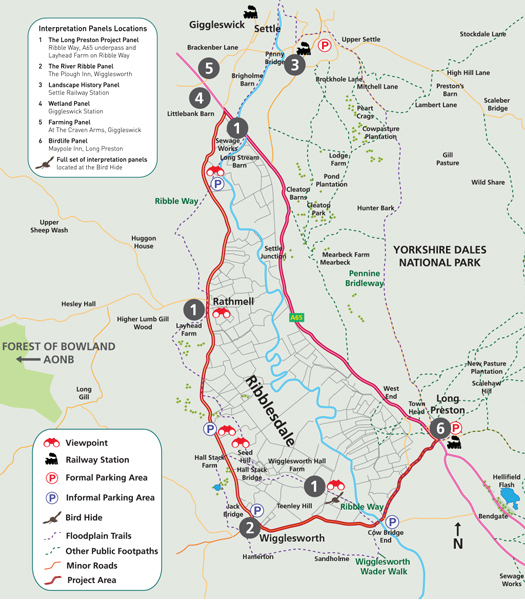 These are the country's best wildlife and geological sites and contain some of our most precious habitats. Over the years farmers have actively drained the floodplain to allow more efficient farming of the land. 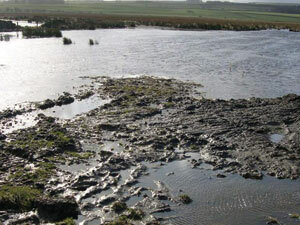 This has resulted in a decline of the wet grassland habitat that supports specialist wetland species. 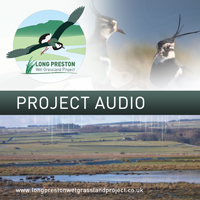 It is possible to restore this wet grassland and improve conditions for breeding wading birds and other wildlife. This can be achieved through retaining shallow areas of water, particularly in Spring to mid Summer. These shallow pools of water provide ideal conditions for invertebrates which are the main food source for waders and their chicks. 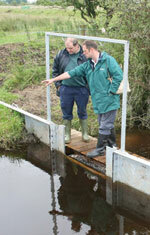 Different methods are used to control water levels on the floodplain. Sluices are the main method; using raised pipes and small dams to hold water back and prevent it flowing in to drains and ditches and off the floodplain. Once the bird nesting season is over in mid Summer, and all the chicks have fledged, the sluices are lowered to allow the water levels to drop on the floodplain. Additional areas of standing water have also been created with the introduction of scrapes and drains in targeted areas on the floodplain. Scrapes are shallow depressions with very gentle sloping edges, they also provide important feeding areas as they support a host of invertebrates in the wet muddy edges. 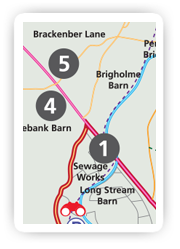 Foot drains are long, linear scrapes which provide similar benefits to that of scrapes. 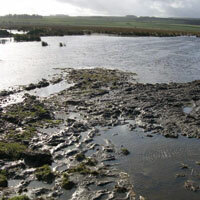 In addition, when water overtops the drains in particularly wet conditions splash flooding is created which are also important habitats for wading birds and wildfowl. 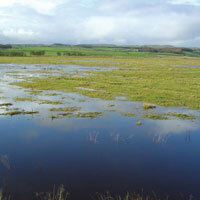 At the southern end of the floodplain a large area of wet grassland remains damp or waterlogged for much of the year. This supports a wide variety of wading bird species, some of which breed here and some that over-winter. Environmental Stewardship is an agri-environment scheme that provides funding to farmers and other land managers in England to deliver effective environmental management on their land. There are 3 elements to Environmental Stewardship: Entry Level Stewardship (ELS), Higher Level Stewardship (HLS) and OELS (Organic Entry Level Stewardship). ELS ensures simple but effective land management across the farm. HLS builds on this to target the management of more complex habitats by building into farm agreements more detailed management requirements. 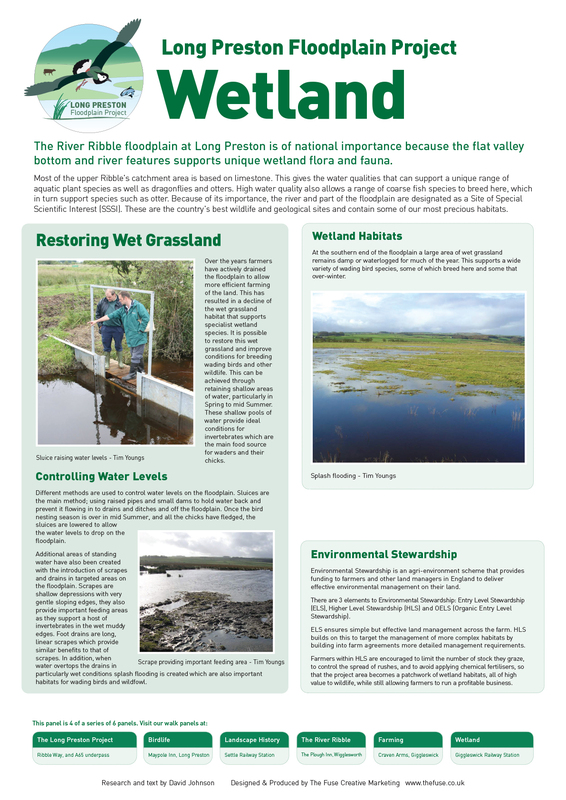 Farmers within HLS are encouraged to limit the number of stock they graze, to control the spread of rushes, and to avoid applying chemical fertilisers, so that the project area becomes a patchwork of wetland habitats, all of high value to wildlife, while still allowing farmers to run a profitable business.